10 years ago, Ichijou Raku, son and heir to the head of the Shuei-gumi Yakuza family, made a promise to a childhood sweetheart that he would marry her when they reunite. As a sign of their love, he has a pendant which can only be opened by the key that girl holds. Raku has kept the pendant since that day, in the hope of being reunited with that girl. But one day, a girl called Kirisaki Chitoge transfers to his class. They don't get off to a good start; things take a turn for the worse for Raku after he agrees with his father to pretend to date the daughter of a rival gang so there is some peace for three years, only for that daughter to be Chitoge. Nisekoi is a romantic comedy which is sweet and entertaining to watch. The story is not as simple as you may think, for it becomes much more complicated yet maintains the comedy aspect to the story as it progresses. 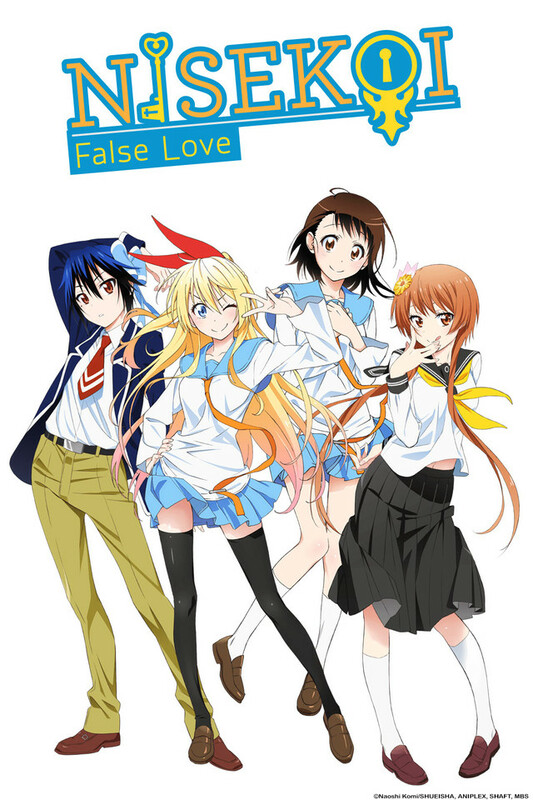 Raku tries to win the heart of his crush Onodera Kosaki whilst maintaining the fake relationship with Chitoge, and hoping to find the girl he promised to marry 10 years ago. And as rival gangs are involved, there are some who disagree with this relationship and try to find a moment when the two "lovers are in disagreement". These, along with other things, contribute to the fun and sometimes romantic moments that make Nisekoi. There are some who, as much as they enjoy the story, want Raku to stop being the dense person that he is. If you have seen the anime or read the manga, you'll know what this means, but if you haven't, then go watch or read Nisekoi and you'll soon come to know. My argument is that, if he wasn't dense, the story would have ended already. The manga is still ongoing, so for those of you who can't wait another week for the next episode to be released, get your daily dose of Nisekoi from reading! This anime and manga are awesome! !! !